Mrs. Frances Williams (née Miller), of Hart, Michigan, passed away on Monday, September 10, 2018. She was 92. Frances was born on February 2, 1926, in Cincinnati, Ohio. She is predeceased by her husband, Junius “Bill” Williams, her daughter Judith S. Williams, her sister, Rosalee L. Frierson, her parents, Edna and Benjamin Gaiter, and her grandmother, Mittie Jones. Frances grew up in Chicago, Illinois and graduated from Englewood High School in 1944. In the 1940s, Frances worked at Moody Bible Institute. Frances loved reading the classics; she was an artist, and musician. She loved to play the organ and enjoyed listening to classical music. Frances married Junius Williams on August 9, 1948. They had five children. Frances is survived by her children: Scott J. Williams (Sammie Jo), Linda F. Williams, Mark G. Williams (Lauree), and Susan A. Williams. 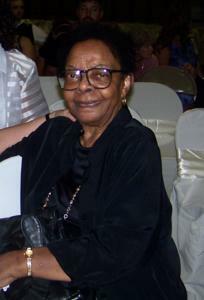 She is also survived by her sister, Deborah D. Bell (Alfred). Her surviving grandchildren include Heather Christmas (Colin), Simone Carney (Donnel Sr.), Martin T. Reyes, Karl J. Williams, Kisha M. DeMyers (Gregory Jr.), Joy J. Williams, A. Michael Williams (Rachel), Jude D. Avery, Mark K. Williams, and Marlise Williams. Frances is also survived by great-grandchildren: Declan S. Christmas, Serenity J. Carney, Donnel O. Carney Jr., Chaya-Marie T. Carney, Junius J. Williams, Gregory S. DeMyers III, Aniyah M. DeMyers, Mariyah G. DeMyers. A memorial service is scheduled for 2:30 PM on Sunday, September 30, 2018, at Park Meadows Home Park - Community Center located at 210 W Giles Road in Muskegon, Michigan.